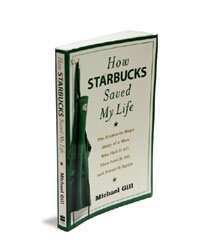 How Starbucks Saved My Life:HarperCollins, 265 pages, Rs195. Upper East Side, a brownstone apartment, Woody Allen-esque milieu, a black nanny, hyper-sociable parents. This was Michael Gill’s childhood in Manhattan. He went on to become a creative director at the J. Walter Thompson advertising agency in New York. He also became a workaholic, married and had children. At 63, bankrupt and out of work, he worked as a waiter at a Starbucks coffee outlet on 95th and Broadway. For one, it is a scathing indictment of the way the advertising world works. The title is deceptive: The heart of Gill’s story is his climb to the peak of his profession, and fall from it. The second half of the book about Michael’s days at the coffee retail store under Crystal, a tough black woman who has risen beyond the circumstances of her life in the Bronx, is more akin to a lessons-of-life book rather than a memoir. Overall, the story is replete with cliches—25 years into his career, Gill is given the boot because the young take over. When the time comes, he has to hear the words from his erstwhile protégé. But sympathy turns into pity when the first thing he does after he is out of a job is have an affair with a woman who goes to the same gym as him. She gets pregnant, his marriage crumbles and he gives away his Manhattan apartment and his savings to his wife and two children. The second relationship sours, too, after the birth of his son Jonathan, with whom he shares a special relationship. The narrative moves back and forth, taking us into the drawing room of his father, Brendan Gill, a renowned critic for The New Yorker, where the likes of Ezra Pound used to hang out. After Michael lands the job at Starbucks, the book lapses into the worst kind of pathos and self-pity—abjectly apologizing for ignoring the poor when he was rich, for showing racial prejudices at his workplace, for ignoring his children when they were growing up. Above all, he has a progressive brain tumour. After three years of the drill, he leaves the job, but working at Starbucks teaches him how to deal with it: “At sixty-four I knew I should take it easy on myself if I could. Already I had a brain tumour, and aches and pains I didn’t even want to admit to myself...Starbucks was a kind of frantic sport—every Partner needed to move fast, with a manual dexterity." Finally, Michael’s biggest achievement is that he has become, as Lester Burnham of American Beauty would say, “an ordinary man with nothing to lose." Gill obviously has no literary ambition. It was undoubtedly meant to be a best-seller. The ad wisdom gathered in his past must have helped—surely, he must have realized that roping in a brand as visible and popular as Starbucks coffee for his memoir would get him what he needed: health insurance and a fat savings account.